I used to never think of it that way. It was just the day that Starbucks brings out their red cups. Besides, I, like most Evangelicals, am a little uncomfortable with the idea of saints. After all, nobody’s perfect, right? But here’s the thing: we can’t help but look for people to inspire us, to show us what it looks like to follow Jesus and embrace His Kingdom here and now. So, what does it look like to have our desire for a role model– for faithful men and women to remember and honor and inspire us– rightly ordered? This, I think, is where the notion of saints comes in. You see, there are a few differences between saints and celebrities. 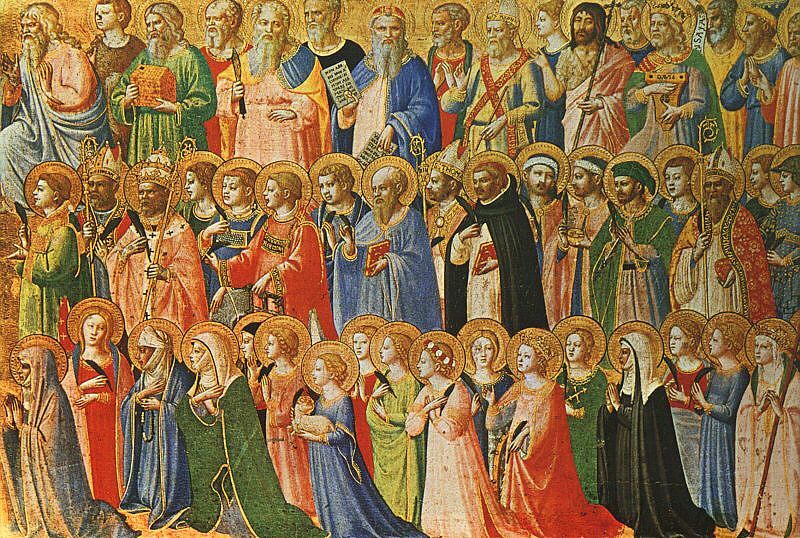 Saints can’t be canonized until they’re dead so we can look back over their life as a whole. Christian celebrities can be made through savvy self-branding and high-cost PR firms. Saints are often admired for what they did not have in this world– their lack of riches, of fame, of acceptance by the world. In fact, the first ‘saints’ were martyrs. The Church began to recognize and honor them around the turn of the second century. Celebrities, though, are often admired for what they have in this world– their large churches, their fame (christened as ‘influence’), their best-selling books or CDs, and perhaps even their houses and cars. Saints are ones whose deep ‘interior life’ with Jesus was often kept secret until others discovered it after their death. Celebrities are those who want to leverage intimacy with Jesus for popularity with others. The list could go on. But I think you get the point: no, saints weren’t perfect; but they are better images– icons– for our rightly ordered desire to see how a human is to live out the Jesus kind of life. The Faith did not begin with us. There are others who have come along this Way. We can learn from them. We can follow them. We can thank God for them. So, here’s to remembering the saints. Here’s to praying that we would be broken of our obsession with celeberities, of our addiction to ‘influence’, and turn to the quiet hidden life of faithful obediece to Christ. May we seek credibility— the mark of a life that is worth trusting– and not popularity. Let renown come if it does. But let our lives point to Christ– crucified and risen. Just as it was with the lives of the saints. “Saints can’t be canonized until they’re dead.” I think you’ve captured something quite practical here. In the hundreds of Evangelically oriented sermons I’ve listened to over the years, there have been many quotes, name drops, and deferences to authorities where most have been the living. And yes, it’s often been around aspiring attachment (and I’ve wondered about ambition) to coat tails of some sort of celebrity’s status. I’ve heard of “mantle” and “touching not of God’s anointed” and of “Godly men”; I’ve heard of much over the decades (and I’ve had opportunity to witness leaders’ inner lives be made public). I’m the grandchild of four (like all of us) and thankfully and exceptionally all of my grandparents were saints: Fred, Dena, Clifford, and Edna (though Edna didn’t really find her peace with the world till her eighth decade). In many ways, I wish I could be like each of them. They’re dead, they’re gone. And All Saints’ Day might be a good day for me to remember them. De facto Protestant polemics aside for the moment, I wonder if the reason Christendom has historically iconified the saints is not because they’re perfect, but because they’re imperfect–even broken–perhaps even just like I might be and hope to be. May my role models be the broken who live in humble service for other. Likewise, having been raised Lutheran, then non-denom evangelical, I had my problem with “saints.” (In our Lutheran tradition, we had no problem calling the first apostles “St,” and naming our churches after them) But it was in Eisenach Germany, in the Wartburg Castle, where Luther hid from Pope Leo that we first learned about St. Elizabeth, the young 24 year old widow and mother of three, during the time of the Crusades. She lived out her life caring for the sick, afflicted, in the spirit of Francis of Assisi, and ultimately, was one of the western influences that brought about the institutions of “hospitals.” There are beautiful mosaics in the castle telling her story. According to our tour guide, as Martin (Luther) would wander the mostly empty rooms of this castle, he grew in his admiration of Elizabeth and she became one of the very few ‘saints’ that Luther would honor with that title. It’s good to see this in print. I’ve often thought something similar – that every bad desire is a good desire that’s been twisted. So we go looking for the good and true desire. I now believe that saints are people whose vocation is not completed in this world, which is far different from what I thought while growing up, when I discounted the notion of saints. Not only are they an example, but I believe that many of them continue to be concerned about this world. Interesting….